Recognizes a 180-185 kDa protein, identified as isoform of leukocyte common antigen (CD45RO). CCRF-CEM, Jurkat or MOLT-4 cells. Paracortex in a tonsil or a reactive lymph node. Recognizes a 180-185 kDa protein, identified as isoform of leukocyte common antigen (CD45RO) (4th Leucocyte Typing Workshop: Code No. N31). The epitope recognized by this antibody is sensitive to neuraminidase digestion. 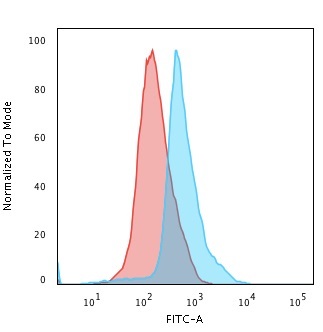 This antibody reacts with mature activated T-cells, most thymocytes, and a sub-population of resting T-cells within both CD4 and CD8 subsets. It shows no reactivity with normal B or natural killer cells, but reacts with granulocytes and monocytes. Reportedly, it is useful to identify T-cell lymphomas and leukemias. It rarely stains NK cells or B-cell lymphomas. Catalog number key for antibody number 0003, Anti-CD45RO (UCHL-1) The prefix indicates conjugation, followed by the antibody number and size suffix.